"...Stone held on to the Fresh masters well beyond the record's official release, constantly remixing and re-recording the tracks. As a result, alternate and significantly different versions of at least ten songs from the album are known to exist. In 1991, Sony Music, by then owner of the Epic catalog, accidentally issued a sequencing of Fresh on CD featuring alternate takes of every song except "In Time", which remained unchanged. Sony allowed the alternate version to remain in stores to be bought up by fans and then later issued the standard 1973 version of the album. However, the mix-up sparked debate among fans over which release was superior. 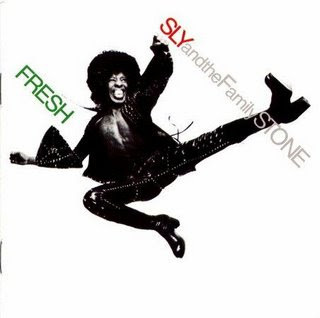 When Sony BMG reissued Fresh in CD and digital download formats for Sly & the Family Stone's 40th anniversary, five alternate mixes were included as bonus tracks. These tracks are extremely similar, if not identical, to the alternate, accidental 1991 release. The alternate version is known to be very accessible in Japan, while it is very scarce in the U.S.."
The tracks from the '91 release duplicated (or nearly so) as bonus tracks on the new version are Let Me Have It All, Frisky, Skin I'm In, Keep On Dancin', and Babies Makin' Babies. The other six tracks here are unavailable elsewhere. I searched for this version online and only found it at one blog, and one which hadn't been updated in two years, at that. It's listed there as "Fresh (Alternate Demo Version", too, which I think may not identify it clearly enough for some to find it. So, while I prefer to post items unavailable ANYwhere else on the web, I think all the above qualifies this disc as some of The Rare Stuff. Granted, it can be had for cheap on Amazon, but for that matter, so can the remastered version from last year. Meanwhile, enjoy! UPDATE: Link removed when it became clear that the standard version had been uploaded by mistake. I'm sorry for the confusion, all who have downloaded it from here! I have a copy of the 1991 Epic CD, and later got the Legacy 40th anniversary issue. Those Wiki comments seem to be correct. The 1991 issue has nothing in the sleeve notes about it being a 'new versison' of the album. Never having heard the original issue of the LP I was puzzled as to why an 'inferior' (as it sounded to me) version eventually came out as the Legacy edition... all is now explained! Oo, this will be cool... I have an Epic version of the CD, but it doesn't say anywhere on it what year it was released. Either way, it will be fun to get this because I love Sly and I love this album - esp "Let Me Have It All," possibly his best ever song. Thanks! I might be missing some something, but I listened to a few tracks back-to-back with the ones downloaded from here. I can't hear any difference. Is it very subtle, or is the download link for the original version? Oh, what an embarrassment. Sorry for the confusion, I didn't listen before I uploaded and apparently have shared the standard version by mistake. I apologize to the over 1,000 who have downloaded it! I'll keep the post up but take down the link.